This year’s hottest bridal party dresses were all about sophisticated silhouettes with a modern touch. Some dainty favorites that were seen down the aisle and beyond include halter necks, one-shoulders, and high slits. While they were all warmly welcomed trends, next season’s wave of bridesmaid attire will take a slightly different and more daring turn. If you're planning on tying the knot next year, you and your bridal party are in for a fine selection of styles. We previously discussed here on Strings Champagne how to "propose" to your bridesmaids, but of course, it doesn't end there! Before settling on the same uniform dresses, check out some of these exciting bridal party attire trends for 2019. First on our list involves a dress that you most likely have already heard of. During this year's Royal Wedding, viewers were sent into an online fire storm discussing Meghan Markle's Givenchy wedding dress. Some criticized its over-simplicity, while others admired its understated elegance. One thing is for sure: many brides will be taking their cue from the newly minted Duchess of Sussex and her conservative-with-a-twist style. It's a surefire way to create a balanced out, elegantly minimalist scene for your wedding, especially if you and your bridesmaids are not into frilly scene-stealers. Florals are not revolutionary when it comes to bridal party wear, but this 2019, we're not talking dainty flowers on a hem. This season, designers have decided to go with a bolder, more lush take on this print. If you're looking to follow suit, just remember not to go overboard by keeping the florals minimal everywhere else. That means skipping extravagant floral crowns and going for simpler bouquets for you and your bridesmaids. 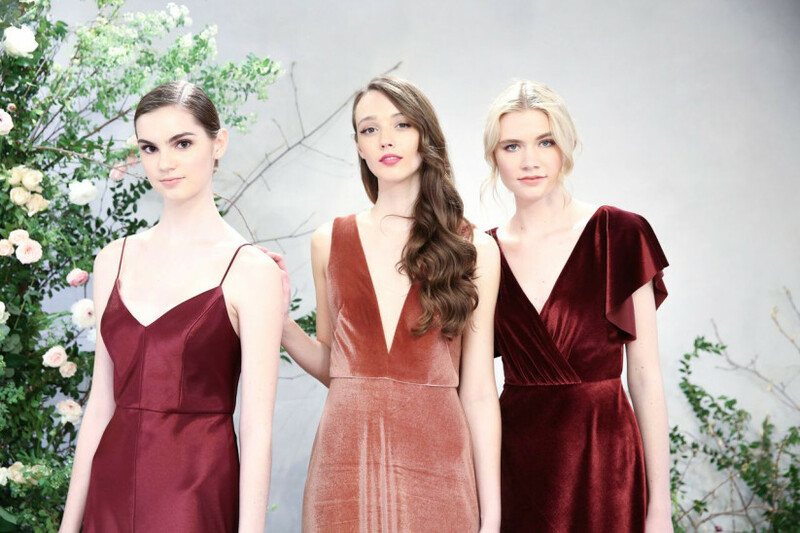 Already hailed as 2019's fabric of choice for bridesmaids, velvet can add that luxe feel to your wedding party look, particularly for fall or winter weddings. Because it can be worn in a range of hues, they make for easy mix and matching. They can also complement your wedding gown seamlessly, while still making for a cohesive bridal party ensemble. Your bridesmaids will appreciate dresses that ensure maximum comfort for dancing all night. For this, a good layered gown provides the same dramatic beauty of a ball gown, minus the weighty and bulky feel. Monique Lhuillier's cinched waist version even gives off a nice, flattering fit that allows them to flaunt their womanly curves. Who says only men can wear the pants? Pantsuits provide a streamlined look that gives off a sleek, feminine vibe. Since bridal party styles have evolved, this will add an interesting mix of variety among a sea of skirts and ball gowns. Brides Magazine notes that there are many styles available for bridal parties — from keyhole cutouts to culotte designs. Bonus: No need to worry about tripping on your hem at any point of the night. Your bridesmaids will also appreciate this highly versatile choice that can be re-used for chic office looks or for nights out. If you want every member of your party to be guaranteed show-stoppers, go for bridal dresses with generous touches of sparkles, glitter or metallic detail. Your bridesmaids are sure to be spotted from a mile away, but for good reason. Embodying the event's festive feel, all that's left is a bottle of champagne and you're good to go. With so many new styles to choose from, it can still be tricky dressing your maids. In this regard, Pretty Me explains that there are many considerations you need to have when choosing attire, such as skin color, body type, and style. Be sure to choose a palette that complements your bridal party's skin type, taking into consideration their color and undertones. You also need to arrange the proper fitting and tailoring to ensure that your bridesmaids look and feel good on your big day. But most of all, remember that there is no one universal dress that can fit every single woman, so feel free to mix it up with your own bridal party.